J. Edgar Hoover (January 1, 1895-May 2, 1972) was the long-serving and controversial director of the Federal Bureau of Investigation. John Edgar Hoover joined the Justice Department shortly after the United States entered WWI. Possessing superb organizational skills, Hoover was promoted to head of the Radical Division within the Bureau of Investigation. 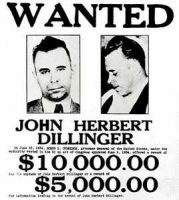 Rising to Acting Director of the Bureau in 1924, Hoover switched the Bureau’s focus from investigating political organizations to criminals. 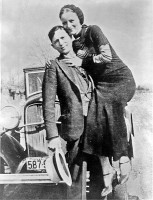 Faced with a wave of violent bank robberies in 1933, Hoover was placed in charge of an expanded bureau, which captured or killed a number of Public Enemies. 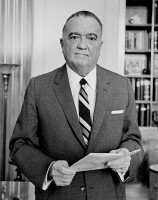 Believing that he and he alone should symbolize the Federal Bureau of Investigation (FBI), magazine articles, books and movies portrayed Hoover as having trained the agents.